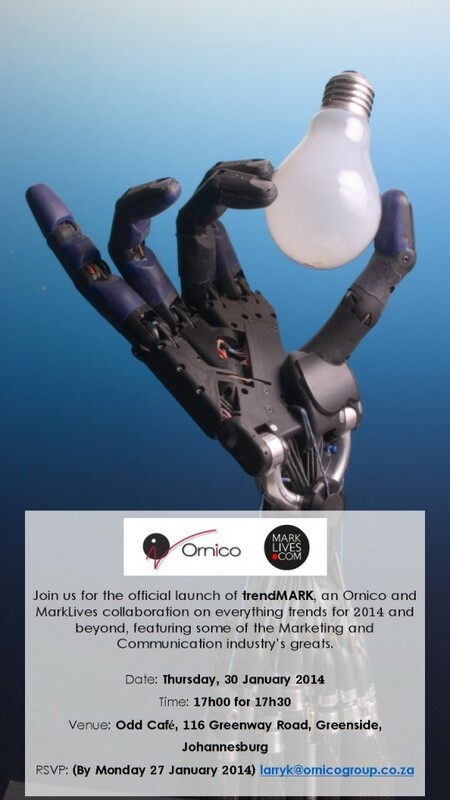 Ornico and MarkLives.com in conjunction with Idea Engineers launch trendMARK, a collaborative guide in e-mag format on the trends and insights marketers must know for 2014 and beyond. Ornico and MarkLives.com collaborate to produce a discerning trends resource for African marketers and corporates. Called trendMARK, the e-mag will be launched on air with Jenny Crwys-Williams and Andy Rice on The AdFeature on 29 January 2014, and at an event at Odd Café in Greenside Johannesburg on the 30th of January 2014 from 17h00. trendMARK is a joint venture between Brand IntelligenceTM company Ornico and MarkLives.com, the authoritative voice of the advertising, branding, marketing and media community in South Africa. Design for this premier annual is done by Idea Engineers, the communications agency with a business-minded approach. The new annual title from Ornico, in collaboration with MarkLives.com, is edited by Mandy de Waal, consulting editor at MarkLives. Formerly an investigative journalist with Daily Maverick, de Waal’s work has been published by The Guardian (UK), Mail & Guardian, Rolling Stone Magazine and other top titles. trendMark features insights from ‘thought leaders’ like Dion Chang, founder of Flux Trends, who has established himself as one of SA’s most influential trend analysts, Entrepreneurial educator and principal at the Ogilvy Digital Marketing Academy Dave Duarte, MD of Idea Engineers Shauneen Procter, founder of Fuseware Mike Wronski, Ornico CEO Oresti Patricios and Head of Digital Strategy at Machine, Andy Gilder. trendMARK contributors touch a wide array of subjects that deal with consumers, the reputation economy, technology and the budding 54 market-strong continent that is Africa. In its launch issue, Duarte outlines a three-step process for deciding what trends are while Chang gives a rundown of top trends in the consumer landscape; from retail disruption, to understanding the millennials and their plenty martyrs. Patricios contributes on media trends looking especially at that the politics of mobile news and Gilder refuses to bark up the wrong tree, urging that we all focus on perfecting what we already know instead of trying to prophesy the future of digital. Procter discusses the bigger picture in incorporating sustainability in business operations, driving the point home, that ‘green’ is not a colour, while Herman Mason, editor and publisher of MarkLives.com discusses the advertising landscape of 2013 and extracts lessons for the adland to learn as we progress into 2014.Gugu Mtshali, Ornico’s Head of Africa Division who’s been eating, breathing, shopping the Nigerian way for seven years, shares on Nigeria’s Retail Death-match. According to Mtshali, everyone must be at the edge of their seats as 2014 and beyond hold more excitement for the West African giant than we’ve ever seen. trendMARK boasts a multi-disciplinary approach in discussing the trends that will dominate the marketing and consumer landscapes in 2014 and beyond. The resource is targeted at business owners, brand custodians, creatives and strategists, marketing and communications executives together with consumers who have an interest in trend watching. These insights coupled with more tools, additional research and analyses make trendMARK an unrivalled and definitive resource for trends and insight. The new annual will be available for download from www.ornico.co.za and from MarkLives’ website, www.marklives.com from January 29th.